The Fortress of Evolutionary Humanism! 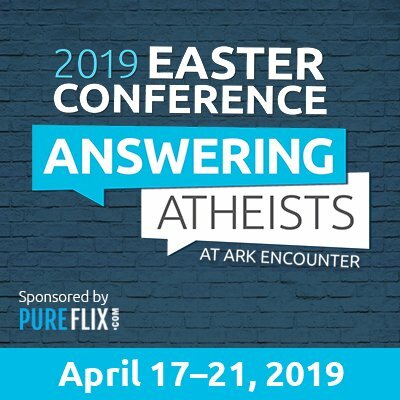 By God's grace and for His Glory, AiG is endeavoring to build a first-rate Creation Museum to help Christians scale the city of secular, evolutionary humanism. In ancient times, fortified walled cities posed a daunting task for any attacking army. The walls of Nineveh or Babylon, for example, were considered impregnable; the people of those cities had the utmost confidence in their safety behind the walls. Similarly today, some walls protect people from a foolish notion that they may disregard God and His Word. On top of these walls stand guards with impressive academic credentials, defending their beloved theories of man. These are evolutionary, humanistic cities … but they are vulnerable. The Apostle is saying that we do not war against physical entities, but our warfare is against the principalities and powers of Satan. Our real weapons, therefore, are spiritual, and the main instruments of war are Christ Himself and His Word, the sword of the Spirit. These are what can pull down the strongholds of Satan in the realm of men. By God’s grace and for His Glory, AiG is endeavoring to build a first-rate Creation Museum to help Christians scale the city of secular, evolutionary humanism in order to bring down the strongholds of anti-God thinking-casting down the vain imaginations of millions of years of death, disease, and suffering, including every high thing that exalts itself against the knowledge of God and His Word. To illustrate this point better, we will close with what some historians consider the most unexpected, yet crucial, moment in the middle of the American Civil War (1863). During the second day of the famous battle of Gettysburg (Pennsylvania), it was a desperate moment for the troops led by Colonel Joshua L. Chamberlain (a professor and Christian theologian, by the way). He had been ordered to protect the Union’s left flank “at all costs.” His men had already successfully held back continuous attacks by the Confederate army. Exhausted and short on bullets, the brave soldiers from his Maine unit appeared near the verge of defeat. As the Confederates renewed their attack on Little Round Top with another attack on the left flank, Chamberlain knew what was at stake. If his troops could not keep the line and the flank, the Northern army would be in a deadly crossfire, and the battle would most likely be lost-and perhaps the entire war with it. In the face of what appeared to be imminent doom, Chamberlain did the unanticipated. He commanded his men to fix bayonets and charge. The men-very fatigued-unquestioningly fixed their bayonets, and charged down the hill into the enemy, and crushed the Confederate offensive. Chamberlain survived with four battle wounds, and later officially received the surrender of General Robert E. Lee’s army at Appomattox in 1865. In a similar way, it is time for Christians to fix their bayonets and charge. Let’s build the Creation Museum and scale the city of evolutionary humanism, and bring down its trusted strongholds to the glory of God and His Word.